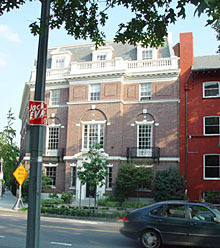 The German Historical Institute in Washington D.C.
Adolf Cluss (1825-1905) was the focal point of an academic conference at the German Historical Institute in Washington, DC. 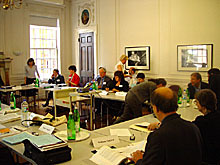 The Institute operates under the auspices of the German government foundation, "Deutsche Geisteswissenschaftliche Institute im Ausland," and is one of the newest among similar institutions worldwide (Rome, Paris, London and Warsaw). The conference opened to a large audience on Thursday evening with a lecture by Professor Richard Longstreth (George Washington University, Washington, DC) that discussed the importance of Adolf Cluss's architectural work in the context of American architectural history: "Cluss set a new course for American Architecture." On Friday the conference covered several topics, from Cluss's youth in Heilbronn (Peter Wanner, City Archives, Heilbronn) to special aspects of "the American World of Adolf Cluss." There were also presentations on Cluss's revolutionary period in Mainz (Dr. Sabine Freitag, University of Cologne), his first year in Washington and his friendship with Marx and Engels (Sabina Dugan, Smithsonian Institution, Washington, DC). Cluss as a German immigrant in the USA and the role of Germans in the establishment of American society was the theme of Professor Kathleen Neils Conzen (University of Chicago), while Professor Alan Lessoff (Illinois State University) discussed the importance of Cluss's role in Washington city politics. The conference concluded with discussions of Adolf Cluss's architecture. Dr. Cynthia Field (Smithsonian Institution) gave a paper on Cluss's "Architecture of Ideas," Architectural Historian, Tanya Beauchamp (Washington, DC) spoke about his schools, and Helen Tangires (National Gallery of Art, Washington, DC) discussed Adolf Cluss's Market Halls and their importance to the American capital's rapidly growing population's food supply. The Director of the German Historical Institute in Washington, Professor Christoph Mauch, led the discussions along with Professor Lessoff. Both will be contributors to a book about the Conference, written in German and English, that will appear concurrently with the opening of the Adolf Cluss exhibitions planned for fall 2005 in Washington DC and Heilbronn.